Abstract: Background: Granulocyte colony stimulating factor (GCSF) is a known glycoprotein, acting as both a cytokine and hormone, stimulating bone marrow production of both granulocytes and stem cells. Some studies have even shown levels of neuroprotection. In this study, we use a high frequency, high dose regimen of Filgrastim on 3 ALS patients to study the various immunomodulatory effects over 3-4 months. Results: T cell and CD34+ cells were detected by using flow cytometry assay on blood samples. Blood levels saw increases in CD34+ cells in the blood after treatment with dose dependent response. 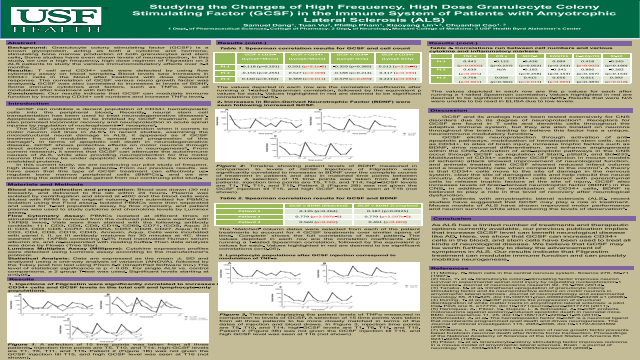 The correlation of GCSF versus neuro growth factor was analyzed. GCSF was also correlated to increases in levels of BDNF. Some immune cytokines and factors, such as TNFα, were all modulated after treatment with GCSF. Conclusion: Our results indicate that GCSF can modulate immune function by increasing CD34+ cell numbers and increase TNFα level. Summary: We believe that GCSF may be worth further study to delay the advancement of symptoms in ALS. Our results indicate that Filgrastim treatment can modulate immune function and can possibly mobilize neurogenesis. References: (1) McKay, R. Stem cells in the central nervous system. Science 276, 66-71 (1997). (2) Guo, Y. et al. Granulocyte colony-stimulating factor improves neuron survival in experimental spinal cord injury by regulating nucleophosmin-1 expression. Journal of neuroscience research 92, 751-760 (2014). (3) Tanaka, M. et al. Intrathecal upregulation of granulocyte colony stimulating factor and its neuroprotective actions on motor neurons in amyotrophic lateral sclerosis. Journal of neuropathology and experimental neurology 65, 816-825, doi:10.1097/01.jnen.0000232025.84238.e1 (2006). (4) Duning, T. et al. G-CSF prevents the progression of structural disintegration of white matter tracts in amyotrophic lateral sclerosis: a pilot trial. PloS one 6, e17770, doi:10.1371/journal.pone.0017770 (2011).